This photo comes from a time-lapse sequence taken by Gabriel Brammer from ESO just two days ago on 22 December 2011. Gabriel was finishing his night shift as support astronomer at the Paranal Observatory when the comet rose over the horizon just before dawn. A stunning comet that survived a recent brush with the sun is amazing astronomers again, this time in dazzling new photos captured just before sunrise over Chile. This beautiful dawn photo of Comet Lovejoy over Santiago de Chile was taken by ESO Photo Ambassador Yuri Beletsky on 22 December 2011 at 05:00 in the morning. The comet Lovejoy may not be the famed Star of Bethlehem, but it still provided a jaw-dropping sight for astronomer Gabriel Brammer, photographed the comet rising ahead of the sun on Dec. 22 at Paranal Observatory in Chile's high Atacama Desert. Brammer is a support astronomer for the European Southern Observatory (ESO), which runs the Paranal facility. His time-lapse photos of comet Lovejoy show it rising ahead of the sun as the Paranal astronomers fire a laser beam, which serves as a guide star, into the sky. Our Milky Way galaxy and the moon are also visible in the images. "On the last morning of my shift I tried to try catching it on camera before sunrise," Brammer said in a statement. "The tail of the comet was easily visible with the naked eye, and the combination of the crescent moon, comet, Milky Way and the laser guide star was nearly as impressive to the naked eye as it appears in the long-exposure photos." "For me this comet is a Christmas present to the people who will stay at Paranal over Christmas," Blanchard said. 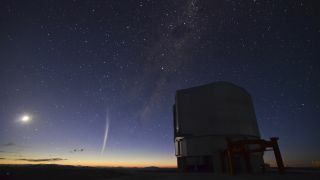 Comet Lovejoy from the VLT, Chile from g br on Vimeo. Comet Lovejoy was discovered on Nov. 27 by Australian amateur astronomer Terry Lovejoy and quickly identified as a so-called Kreutz comet, a comet which flies on an orbit that swings extremely close to the sun. The comet was about 660 feet (200 meters) wide when it was first seen. Astronomers initially expected the comet to be destroyed when it plunged through the sun's outer atmosphere on Dec. 15. But the comet defied all predictions and survived the encounter, despite coming within 87,000 miles (140,000 km) of the sun's surface. Since then, comet Lovejoy has continued to provide spectacular views to skywatchers on Earth … and in space. On Wednesday (Dec. 21), NASA astronaut Daniel Burbank was amazed to see the comet rising over a nighttime Earth from his vantage point on the International Space Station as it sailed 240 miles above Tasmania. Burbank, who currently commands the space station, snapped about 100 photos of the cosmic sight, which NASA later assembled into a time-lapse video of comet Lovejoy. International Space Station Commander Dan Burbank captured spectacular imagery of Comet Lovejoy from about 240 miles above the Earth’s horizon on Wednesday, Dec. 21, 2011. "When it disappeared behind the sun, I think astronomers thought it would not appear again, it would probably burn up," Burbank said in a NASA video. "But it's probably the most spectacular thing that you can imagine." Comet Lovejoy is now headed away from the sun as it travels along its highly eccentric orbit, ESO officials said. It may return to Earth's night sky in the year 2325, when its orbit brings it back into the inner solar system, they added.